The first volume of Precipice features twenty-one short stories and essays from seventeen members of the Write on Edge community. The story by AmyBeth Inverness is called Abandon, about a woman with a unique approach to dealing with her breast cancer. Smashwords for e-readers of all kinds, including Kindle, iBooks, Nook, Kobo, and Sony. You can buy the second volume of Precipice from Amazon, Barnes & Noble and other markets. FELT TIPS – The World’s Greatest Charity Anthology of Office-Supply-Related Erotica is here! The story by AmyBeth Inverness is called In the Closet, about a woman with an ingenious solution to the frustration she feels when her anniversary dinner is cut short. 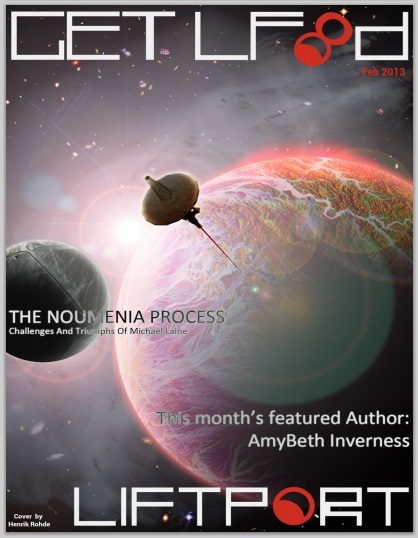 In 2013, several short stories appeared in GETLF8d, the magazine of the Liftport Group. The short story by AmyBeth Inverness, The Genesis of the Incorporem, tells of other creatures that God created, yet Adam could not understand. You can buy the antho on Amazon, Barnes & Noble, and other markets. The next anthology in the Biblical Legends Anthology Series is Sodom and Gomorrah. Look for it in the summer of 2014. The short story by AmyBeth Inverness, The Remorse of the Incorporeum, tells of the creatures (introduced in The Genesis of the Incorporeum) as they move back and forth in time, visiting hosts in a faraway happy future, a troubled mid-twentieth-century, and in an ancient city about to be destroyed. This anthology can be purchased at Barnes & Noble, Amazon, and other markets. The next anthology in the Biblical Speculative Fiction anthology series is The Deluge. My short story The Immersion of the Incorporeum will appear in this edition. The House on Paladin Court is a short Urban Fantasy story about three immortal Paladins keeping house and guarding a secret in suburban Wales. Sharing a birthday not only with each other but also with the founding of the lunar colonies themselves, Moriel and Kellan are resigned to being minor celebrities for the centennial celebrations. Their friendship, which has lasted a century, is sorely tested when old jealousies arise.